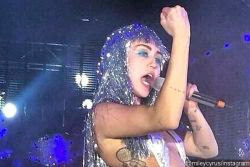 The singer Miley Cyrus performed a new song this Wednesday (3) during Art Basel’s show in Miami Beach. Entitled "The Twinkle Song", the song was composed by the artist who revealed that the song was inspired by the death of her friend's cat. "I never touched alone on a stage before, and never played a song that had only played in the living room of my house, so I'm a little nervous," said the star before starting to play the piano. "I feel that her cat kind of told me what I should tell her to overcome that, it was more like a therapy to me than anything else." Twinkle Song by Miley Cyrus was an awesome song.